About: One of London's original DJ pubs. Real ale, cask beer, Patty Smith's Burgers. Live music and DJs upstairs, always free entry. Big beer garden out back and a roof terrace up top. The Lock Tavern was spinning indie rock when most of us were still in our nappies bopping to the Bangles and it shows. The slick line-ups feature new bands and manage to snag live and DJ sets from established artists. Kitty, Daisy and Lewis were just one recent vintage to take to the decks. If you’re lucky you may have established yourself a large group of friends over the years. What large groups hate is to be packed in tight in some underground cellar bar on someone’s birthday. 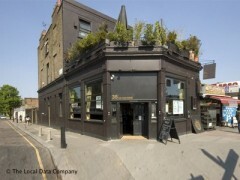 Which makes the Lock Tavern in Camden the perfect place to celebrate one’s annual anniversary. It’s hip, there are DJs and there’s plenty of space to run around. "New music with a whiskey chaser"
The Lock Tavern is Sunday favourite for Camden locals thanks to its artery-thickening, hangover-curing meals, eclectic yet non-intrusive music policy and free entry. Auchentoshan Presents continues in same vein, with a mixture of DJs, acoustic performers and bands meaning there is something for everyone to dip into. Auchentoshan is in fact the name of a triple distilled whiskey from Glasgow, therefore naturally this curious event begins with a free tasting session at 3.30 pm, where you will hopefully be able to perceive the maturity of a 12 year aged single malt (can you taste the nuttiness and the smooth aroma of caramel? No? Just nod your head like everyone else so that you don’t appear foolish). Upstairs, where the live music takes place, empty boxes of the whiskey have been placed on the shelves around the bar to subliminally encourage the purchase of the drink, however more attention is being paid to the live acts. Today’s event is curated by Huw Stephens, Radio 1’s champion of the unsigned, who has chosen electro-popster turned soulstress CocknBullKid to do a DJ set, reverb-loving French singer Koudlam to perform live and the bass-quaking SBTRKT to end proceedings. Sundays at the Lock always have a good combination of laidback drinking and music , and Auchentoshan have seized the perfect opportunity to create a bitesize musical showcase. There are five more dates scheduled for 2011 at the Lock, and the event takes place monthly. "Free music at a cosy Camden pub"
Since the demise of the Hawley Arms, Camden’s pubs have all been vying for most favoured drinking hole of the rock ‘n’ roll stakes. The Lock Tavern is one such music-hosting venue, and despite reports of appalling queues and service whenever a band is on, my visit was most pleasant and might I add, very inspiring. Despite living locally for almost a year, I had yet to venture to this pub on Chalk Farm road. Its black exterior contrasted with a pretty roof terrace had intrigued me for months, visually standing out from neighbours like the Barfly and the Monarch. As I walked in I realised the Lock Tavern was one of those pubs that reminded me of fireplaces in winter, its red ceilings and old fashioned décor evoking the cosiest of evenings, like a glass of good brandy when coming in from the cold. The roof terrace and upstairs area where musician David Holmes was DJing for the afternoon were packed, however people were kind enough to huddle to one side of a sofa to give us space to sit, and from here we were millimetres away from Mr Holmes, who was full of smiles himself. From Thursday to Sunday there is live music, and entry is always free. The usual pub fare features on the menu with the addition of a variety of roasts on Sundays. During my visit I stuck to drinking red wine, which was strangely enough palatable, and only £3 a glass. Unsurprisingly busy for a free set hosted by two of the UK’s premier DJ’s, Holmes and Andrew Weatherall, I found both crowd and staff friendly and accommodating. Rather than encountering tout le Camden in emo/rock/vintage gear people were relaxed, seated on the loungy sofas in the upstairs bar or chatting over pints and cigarettes on the sheltered roof terrace, with many getting up to dance. A perfect Sunday, perhaps it was down to the DJ, but I couldn’t have been in a better place. The Camden Lock Tavern has to be the most pretentious bar in Camden with appalling staff attitude. I rang up recently to book space for 30 people for my practice in celebration of a recent award and found the lady at the other end of the phone incredibly unhelpful and quite frankly rude. After putting down the phone i decided to take by business elsewhere namely the Camden Arms - not that the Lock Tavern was bovvered!! In true Catherine Tate style!! 30 people in a bar on a Monday afternoon is a lot of money and repeat custom that they missed out on because some snotty bar person!! Don’t bother going there are far cooler places to go in Camden where memberships a smiling face! !